CUSRS, organized by the Colorado Space Grant Consortium, is an opportunity for students from 21 Colorado universities and colleges to present their current research and ideas in the aerospace industry. This paper and presentation competition allows students to be published in an official conference and compete for cash prizes. This year there were 39 papers, posters and demonstrations and more than 100 attendants at the symposium held at the University of Colorado-Boulder. Mimlitz’s research focuses on programming robots to make decisions based on perceived hazards and rewards. Most of his work has been in developing a simulator to model rovers on Mars. “The focus of the research is on extraterrestrial rovers, but could be applied to any kind of decision making process between conditions with high risks of failure,” he said. Mimlitz has been working on the project with Department of Mechanical Engineering Assistant Professor Douglas Van Bossuyt since fall 2013. The entire project currently has four undergraduates and one graduate student on working on it, Van Bossuyt said, noting graduate student Adam Short has also been leading much of the research effort. 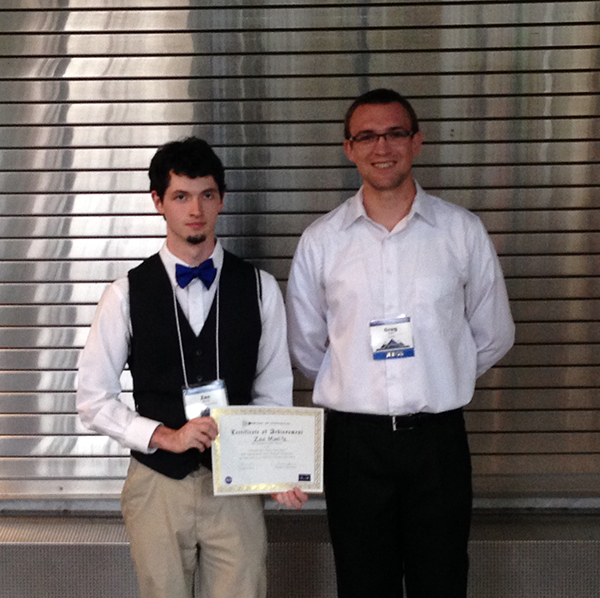 Mimlitz, who is pursuing a minor in computer science and an area of special interest in space and planetary science and technology, also recently participated and did well at the American Institute of Aeronautics and Astronautics Region V Undergraduate Research Conference, held in Kansas. He has been awarded the Mines Undergraduate Research Fellowship for several terms in a row and also was nominated for Student Employee of the Year.